Learning will happen everywhere – at school, at home, in the community, in workplaces, and online. You have to be ready. You have to know when learning is possible. This book will outline how you can learn to learn. This book is a big plan about learning big ideas. ‘This clear and clever reference book about Big Picture learning will prove to be a great resource for students, parents and advisory teachers. Whatever you want to know, you’ll find it here’, says Viv White, Big Picture Director. The key idea for the book is the learning cycle. The cycle of learning at a Big Picture school always starts when you identify your interests and passions. You then create your learning plan based on your needs and interests with your advisory teacher and your family. 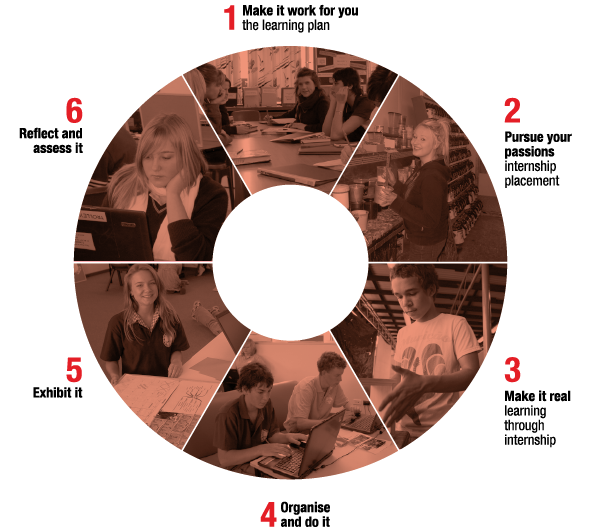 The Learning Plan provides the map for your term’s work. You then set about finding out more about what you need to do, making connections in the community, setting up internships, creating projects to do, and of course, doing them. Each term you exhibit your learning to a group of people – other students, teachers, family, and community members. You talk about what you are doing and what you are learning. Then you review your progress, assess your achievements, and make new plans. The Learning Cycle reference book is 86 pages long, spiro bound and a significant resource for all involved with Big Picture Education design.